Special Containment Procedures: SCP-3289 is to be kept in a standard secure locker with constant monitoring to detect anomalies in behavior. Only Level 2 or higher personnel are authorized to remove it from its containment. Copies of SCP-3289 are to be stored away in a secure cabinet. Personnel should request permission before testing on SCP-3289. Description: SCP-3289 is a standard 4A sheet of letter paper. The sheet of paper is unable to be altered until it replicates. Every 4-5 minutes, a hand drawn cartoon face will appear, with eyes, mouth and sometimes nose appearing. The appearance of the faces vary, with numerous different emotions being portrayed, the detail varying from simple to complex. Investigation has revealed that the faces are drawn with a thick graphite tool, though the tool has yet to be seen. 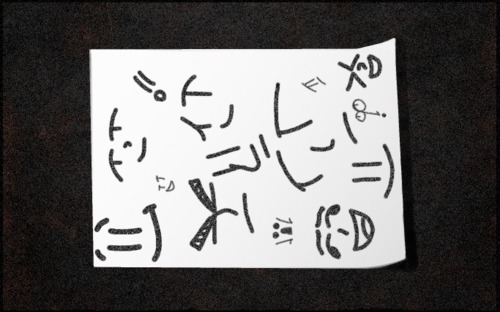 SCP-3289 will continue to produce the faces until the page is full on both sides of the paper, upon which a separate piece of blank paper will appear underneath the current sheet1. The original sheet does not display any further anomalous properties and can be torn, erased, burned, etc.. The new sheet will continue to produce the faces until the process repeats. SCP-3289 has yet to stop replicating itself, with ███ copies in possession of the Foundation2. SCP-3289 has some sense of its surrounding, as it has been able to react to nearby beings, creating different faces in response to the nearby creature. The emotions portrayed do not come from the creature, instead appearing as the emotion that SCP-3289 holds toward the creature. SCP-3289 was found in the ███████ Asylum, which treated numerous insane patients. Patient #████ was a 67 year old mute and deaf man being treated by Doctor ████ who was, according to staff at the Asylum, portrayed his emotions through writing faces on pieces of paper. This was the main way Doctor ████ communicated with the patient, learning a new language that was made out of purely drawn cartoon faces. During an incident in which a violent patient broke out, Patient #████ was killed, as well as 4 others. Staff of the Asylum recovered Patient #████'s paper, which Doctor ████, the patient's personal doctor as well as close friend, hung up on his office wall. The doctor began to report faces appearing on the paper, which he recognized as the ones that Patient #████ used to draw. This incident was reported in the local newspaper as a "haunted paper," gaining the attention of Foundation personnel. Amnestics were administered throughout the Asylum and the paper, now designated as SCP-3289, was extracted. Reaction: 5 minutes after the dog was first brought in, a face was drawn which expressed an extremely joyous emotion, drawn with heavy detail compared to previous faces. It is believed that this detailed image is the face of Patient #████. Once the dog was removed, a face was drawn which expressed sadness and apparent loneliness, again with heavy detail. Note: It is believed that the detailed images portray the original face of Patient #████. Reaction: 5 minutes after the cat was first brought in, a face was drawn which expressed discomfort. This reaction stayed this way, with various changes in the faces, for 10 minutes until the cat was removed from the cell. Another face was drawn 5 minutes after removal that expressed gratitude. Note: SCP-3289 seems to hold the same attitude toward cats that Patient #███ had, who was allergic to cats according to Asylum records. Reaction: 5 minutes after the child was first brought in, a face was drawn which expressed sadness, drawn with heavy detail, similar to the previous log. SCP-3289 remained unresponsive for 10 minutes after the child was removed before it began its usual cycle. Note: SCP-3289's reaction could be connected to the reason why Patient #████ was in the Asylum. Further investigation is required. Patient #████ had a niece before being escorted to the Asylum. Reaction: Dr. █████ was alone with SCP-3289 when a face was drawn that had eyes looking directly at the doctor, a wide smile on its face. Dr. █████ stayed in the room for 5 more minutes, upon which a face was drawn similarly. It did this for 15 more minutes, the eyes tracking the doctor no matter his position, until Dr. █████ left the room, which SCP-3289 responded to with a face of disappointment. Note: SCP-3289 appears to have positive emotions toward Dr. █████. This could be due to Patient #████'s previous relation with their doctor at the Asylum, and SCP-3289 made a connection with Dr. █████. Reaction: Dr. ███ stayed in the containment chamber for 5 minutes when a face was drawn on SCP-3289, which portrayed confusion. 5 minutes afterwards, a new face portrayed extreme anger, heavily detailed. This face continued to be drawn when Dr. ███ was in the room, with proportions growing larger until the angry face covered the entire page, upon which Dr. ███ was escorted out of the room. Note: SCP-3289 reacts extremely when confronted with a replacement doctor to Dr. █████. In order to remove the risk of potential hostility, Dr. █████ will continue to be the head researcher of SCP-3289. Reaction: SCP-3289 did not react when Dr. █████ attempted to talk to it. Instead, it continued portraying various emotions, mainly excitement (likely due to the presence of Dr. █████) until 25 minutes in a face expressed annoyance at the experiment. Experiment was aborted. Note: SCP-3289 shares the deafness of Patient #████ before his death. Any further verbal communication wielded similar results. Reaction: Dr. █████ wrote on a paper facing SCP-3289. First he used written English, to which SCP-3289 reacted with a face of confusion. Other languages provided similar results. Dr. █████ then used faces similar to the ones on SCP-3289, portraying a face asking questions. SCP-3289 reacted with a face of understanding, though it is unknown if SCP-3289 could tell what Dr. █████ was asking. Note: SCP-3289 does not appear to understand English or any written language. Researchers are currently looking for a way to ask SCP-3289 questions through the same sort of faces it uses. Reason for Residence: Was found unable to communicate efficiently with those around him. Family urged the asylum to let the patient stay in order to heal him. Medical History: Patient is deaf and mute. He suffers joint pains regularly. Patient frequently has memory issues; possibly dementia. Notable allergy of cats. Special Notes: Patient uses faces drawn on paper to communicate and convey emotion. Has so far not shown ability to speak. Doctors are to draw faces on paper to communicate with the patient. Foreword: Doctor ████ was interviewing Patient #████ by drawing faces. Doctor ████ vocalizes what he draws to help viewers to understand what is going on. 1. Sheet can appear on any surface the original is placed on. 2. Using copies of SCP-3289 for scrap paper is prohibited in case the current SCP-3289 is to be used and potentially misplaced.